Good news LoL fans! League of Legends was selected as one of six esports to debut at the 2018 Asian Games as an Official Demonstration Sport. The Asian Games a.k.a Asiad is a continental multi-sport event held every four years among athletes from all over Asia. The event is recognized by the International Olympic Committee as the second largest multi-sport event after the Olympics. The 2018 edition will be held in Jakarta-Palembang, Indonesia from August 18 to September 2, with the League of Legends akibat round taking place in late August. This will be an exciting opportunity for League of Legends fans to see some of their region's best players represent their countries at the Asian Games. The Riot Games Esports will do their part to support the event by advising the Olympic Council of Asia and its member nations during the team selection process and in building the tournament format. Additionally they will be making changes to some regional league calendars in split 2 to help make pro player participation in the Asian Games possible. The five Asian Games Regional Qualifiers will take place during June and will invite 45 nations and regions to each field a team of five players. The qualifier process will narrow down the field to eight teams that will advance to the Asian Games. The host nation of Indonesia will receive an automatic invitation to the games. Winners of the South East Asia, South Asia, Central Asia, & West Asia (as defined by the Olympic Council of Asia) qualifiers will each receive an invitation to the games. Due to the highly competitive nature of East Asia Qualifier - which includes China, South Korea, Chinese Taipei, Hong Kong, Macau, & Japan - the top three teams will receive invitations to the games. According to Riot Games, each country's National Olympic Committee will be free to choose the method by which they select their representative players. Where possible, Riot will consult with National Olympic Committees to provide guidance on how to assemble national teams. Riot will anticipate that countries will utilize a variety of unique methods to build their representative teams. "We're honored that League of Legends was selected for the Asian Games. Representing one's country at the Olympics is a dream for athletes around the world, and with this step, that dream is one step closer to reality for the best in our sport. We admire and respect the values of the Olympic movement and look forward to supporting the Olympic Council of Asia in making this competition a success." said Jarred Kennedy, Co-Head of Riot Esports. Broadcast production and tournament operation will be managed through a joint partnership between Tencent and the OCA. Additional streaming details will be announced closer to the event. Esports is a demonstration sport at the 18th Jakarta-Palembang Asian Games 2018 this August. 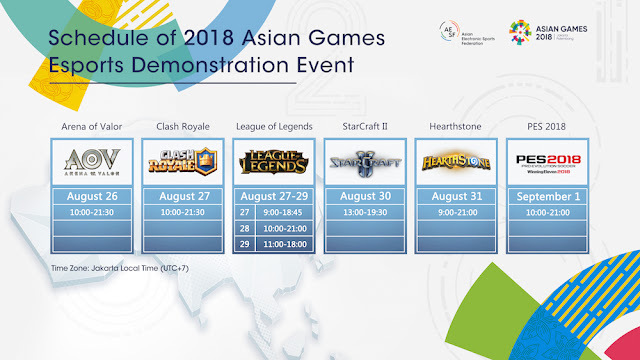 The competition, co-organized by the Olympic Council of Asia (OCA), Asian Electronic Sports Federation (AESF) and the Indonesia Asian Games Organizing Committee (INASGOC), will feature six events namely League of Legends, Pro Evolution Soccer 2018, Arena of Valor, Starcraft II, Hearthstone, and Clash Royale. Indeed, esports now should be taken seriously as it is widely recognized by different organizations. In the Philippines, esports has been always supported by Senator Bam Aquino. In China, esports is recognized as an official sports kegiatan by General Administration of Sport of China. What can you say about the progress of esports industry especially this participation of LoL in the 2018 Asian Games? Let us know your thoughts by leaving your comment below.